Bintray’s central repositories, JCenter and Conan-Center, are binary hubs for public OSS Maven and Conan (C++) packages respectively. They offer a great channel to distribute your public OSS packages. Having been around for a while, JCenter has become one of the most comprehensive sources for public OSS Maven packages, and is the channel-of-choice for many Maven projects. So we weren’t surprised to discover this blog post that describes how easy it is to distribute Android libraries through Bintray and JCenter. Distributing Android libraries (or any other Maven package for that matter) through JCenter has its advantages. As one of the most popular Maven hubs, it exposes your package to a huge audience, and yet, you retain full ownership and can control how your package evolves. Basically, you upload your package to one of your public Maven repositories and ask for it to be included in JCenter. Once approved by the Bintray team, your package will be searchable on JCenter and freely available for download. You can learn about the details in the blog or look it up in the Bintray User Manual. So if you’re ready to give your package world-wide fame, go ahead and open an account on Bintray. Bear in mind that since JCenter is a curated repository with trusted content, you need to be on a fully registered OSS or Premium account (as opposed to being on a trial) before you can link your package. To start with a free OSS account, you can sign up here. If you’re ready to go Premium (Pro or Enterprise), go here. And if you want the full Enterprise experience, without committing to it yet, you can start a free trial (just remember to switch to an OSS or Premium account if you want to use JCenter). One of the great features of a Bintray Enterprise account is the ability to present a EULA when a user downloads one of your Products. That works well for the general case when the downloading user is a real person who can go through the Bintray UI and physically accept the EULA for publicly available content. This is something we discussed in a previous post. But what if you want to be more selective about who can download your content, and you want to limit it to a defined set of people? And what if those people want to download your content using automated scripts? And what if they don’t even have an account on Bintray? Those are a lot of hoops to jump through, but Bintray now offers a solution to this common circus of circumstances. You can now offer automated EULA-protected downloads through the REST API to any pre-defined set of users, whether they have a Bintray account or not. You create an entitlement which gives access to your product and then you provide the corresponding access key to your user. Bintray then displays the EULA for your user to accept. From now on, any REST API call that includes the access key you provided to your user will succeed unhindered by the EULA, since the EULA has already been accepted using that key. In other words – automated EULA-protected download. And who gets this privileged access? Not everyone. Only those who are privileged enough to receive the access key you created to protect your content. In other words private, automated EULA-protected download. Protecting your products with a EULA has never been easier, whether you are offering something for public download, or whether you want to expose private content to a defined set of users. OpenWrt is typically associated with network routers and similar equipment, and indeed the official OpenWrt website lists overs 1200 devices on which it runs. Network routers may sound boring (well, to some of us), but as the Internet of Things (IoT) continues its crusade around the world, many people don’t know that OpenWrt is also used on other devices such as phones, robots, sensor networks and more. To accommodate these more glamorous devices, and implement their cool features and functionality, and to give a network router an edge beyond the basic functions, you need a bit more than the Linux kernel on which OpenWrt is based. This good stuff comes in the form of over 3,500 Opkg packages which are available for download from public repositories. 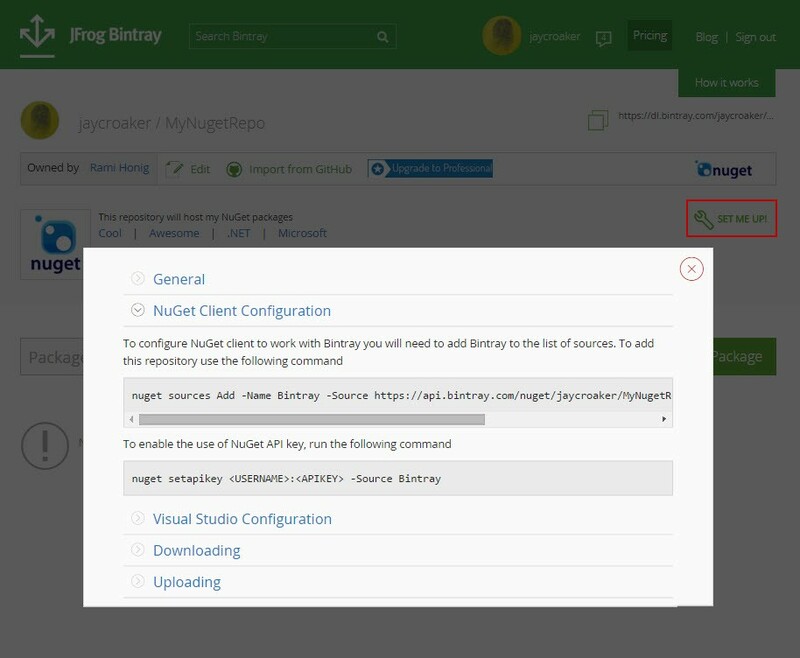 The good news is that JFrog Artifactory and JFrog Bintray together offer developers an end-to-end solution to manage their Opkg packages from development through to distributing them automatically to all those routers and robots alike. While you can use Bintray to distribute your Opkg packages independently of Artifactory, using Artifactory for your OpenWrt development, can speed up your development cycles. For example, Artifactory support for Opkg gives you local repositories for the components you are developing, remote repositories to proxy remote ipk packages and get all those dependencies you need, and it even handles GPG signatures to verify packages. Once your packages are ready to go, use Artifactory’s Distribution Repository and push them to Bintray. Bintray support for Opkg lets you work transparently with the Opkg client to resolve packages from Bintray and to upload them for distribution. As a mature and universal cloud platform for the distribution of software, Bintray can deliver software updates to users and devices alike over fast CDN, with advanced security features like access entitlements, detailed download stats and logs and more. Upload your “ipk” file using Bintray’s REST API. curl -T kool-bot-utils.ipk -ujaycroaker:myapikey https://api.bintray.com/content/jaycroaker/opkg-distributions/robot-utils/1.0/. Once your file is uploaded, Bintray will calculate the repository-wide Opkg metadata to maintain compatibility with the Opkg client. If the version specified in the command don’t exist, Bintray will create it for you. And of course, you can do all of this through Bintray’s REST API, or through the JFrog CLI and in that case, you can do the above and publish the file in a single call. You don’t even need to memorize these lines. Bintray has a cool Set Me Up feature for every repository type that displays these code snippets for you to copy and paste into your scripts. So if routers, robots, and OpenWrt are what make your day, have a look at Bintray’s support for Opkg. Need private repositories? Check out Bintray Premium where you can use signed URLs and access entitlements for fine-grained control over who (or what) can download your ipk files. We envision the day when, not only routers and robots, but all devices get their software updates from Bintray. When you publish software for distribution on Bintray, you generally want to give it as wide a reach as possible and expose it to as many potential users as you can. But there are also cases in which you have to restrict access to certain countries. For example, government security or export regulations may forbid you from doing business with certain countries, or your own company may even restrict your particular organization to distributing your software in your own local region of the world. This is where Bintray’s Geo Restriction feature saves the day. Bintray’s Geo Restriction feature works by letting you define a whitelist or a blacklist per repository. If you create a whitelist, only users from countries entered in the list will be able to download software from the repository. A black list works the opposite way; users from countries in the list are forbidden from downloading software. Bintray determines where a download request is coming from by passing the request IP to a GeoIP provider who determines the country from which the request originated. Then, if a Geo Restriction is applied to the target repository, Bintray will make sure the request can be honored according to the whitelist or blacklist defined. For download requests from countries restricted from accessing a repository, Bintray will respond with an error. Geo Restriction is available for repositories in an Enterprise account. Gold account users can also see how this feature works, but are limited to one country in the list. You can define a whitelist or blacklist by selecting the Geo Restriction tab in the Edit Repository page for each of your repositories. Note that you can only edit the repository if you own it, or if it’s owned by an organization of which you are a member and have the required authorization to do so. A Geo Restriction overrides any other form of “permission” in Bintray. In other words, even if a user is a member of your team and has “permission” to download a file, or even if you’ve provided someone with a signed URL or an entitlement to download a file, if their request comes from a restricted country, it will be blocked. As long as you’re distributing public open source software, you don’t need a EULA. Just choose from the over 100 open source licenses Bintray offers to get the level of protection you want. Once you move to distributing commercial software, you need a EULA. This is the contract that you make with all of your users when they download your software from Bintray. Without a EULA, you’re exposing yourself to lawsuits and unmitigated copying and redistribution. Now, we’ve all seen EULAs. Whether they’re entitled “Terms of Service”, “Terms and Conditions”, or “Here’s what you can and can’t do with my software”, essentially, they are the same. They usually pop up early on in the installation sequence of any new piece of commercial software we install. And I can tell you, with 5-nines of certainty that most of us just click “Next” without reading them, and complete the installation. But there is a breed of people who actually DO read EULAs. They are usually sequestered in some corporate enclave, and it’s their job to make sure that the company they represent can accept the contractual obligations you set forth in your EULA. Yes, these are the company lawyers. Without their “OK”, your potential enterprise customers will not use your software. Now, as smart as lawyers may be (or not), if your EULA is hidden somewhere deep under /etc/this/that/and/the/other, it’s going to be difficult to find. There’s no reason to make this difficult. Bintray gives you an easy way to expose your EULA through Products. Say you developed your “packageOfTheCentury”, and, naturally, you want to offer it to developers on different platforms. I.e., you might have your debianPackageOfTheCentury, nugetPackageOfTheCenutury, npmPackageOfTheCentury…and so on. Since all these packages represent the same product, just for different packaging formats, you will want to apply the same EULA to all of them. This is where Bintray Products come into play. Products are available with a Gold or Enterprise account, and let you collect all the packages under one roof as a single coherent offering, making it easy for you to manage. It’s also easier for potential users to find your single product rather than searching for all its components separately, and any update you make to any of the constituent packages in your product is automatically reflected as a new version of the product itself. But the biggest benefit is that you only need to assign a single EULA to your product, and it applies to all of its constituent packages. And the beauty of it is that your EULA protects your product, for both authenticated and anonymous users, before it’s even downloaded, rather than being embedded inside the packages. That also means that it’s easy to update online as any of the constituent packages are updated with new versions. Creating a Product is easy. And once your product is created, and you’ve entered its basic details, it’s easy to add packages to it. You don’t even have to change your product’s version manually; it is automatically derived by Bintray any time the version of one its constituent packages changes. And if you really want to, you can assign a different EULA to different versions of your product as needed.You don’t even have to change your product’s version manually; it is automatically derived by Bintray any time the version of one its constituent packages changes. And if you really want to, you can assign a different EULA to different versions of your product as needed. With a Bintray Enterprise account, you can manage all of your EULAs in one place and set a default EULA to be assigned to all new versions of this product that are created. You can create a new EULA at any time using Asciidoc, Markdown or free text. And once you have a EULA assigned to your product, if anyone (even an anonymous user) tries to download a file from one of the packages in your product, they will have to accept your EULA first. In fact, the download URL provided by Bintray for any of the packages in your product will first pop up the EULA and require the user to accept before proceeding with download. That means you can provide a EULA-protected download link from any other app. Just hover over the package in your download list to see it. Why don’t you try this one to see how it works. Here’s what you should see. By collecting the different packages you are offering under a single product, governed by a single EULA, you’re protecting your interests, making things simpler, and reducing your (and your customers’) legal costs. Can you think of any better way to protect your IP and keep both your lawyers and your customers happy? Read all about managing products and EULAs. Developing on .NET? Then, most likely, you are no stranger to NuGet Gallery. It’s a great place to find public NuGet packages. But is it the best place to host and distribute your own private packages? With the recent addition of native support for NuGet, you can now point your NuGet client to Bintray and transparently use it as your download source for NuGet packages. 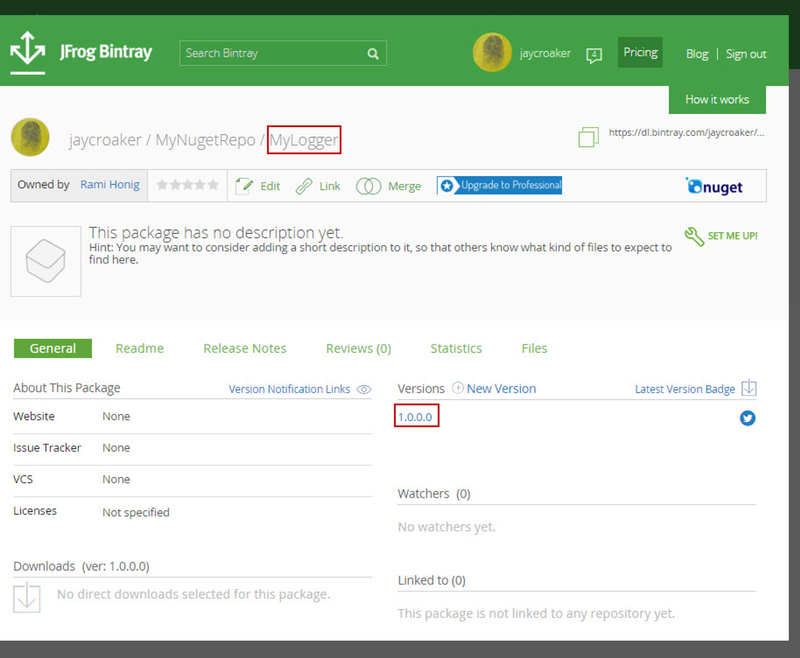 In this post, I’ll show how Bintray complements NuGet Gallery and the benefits it offers for the commercial distribution of private and public NuGet packages. With a professional account on Bintray, you can create private repositories and set up teams of users with different permissions according to the access you want to provide each team. Using keys and entitlements, you can provide external users who don’t have a Bintray account access at any level of granularity, from a whole repository down to a single artifact. On Bintray, every package is accompanied with a variety of metadata that can be used to search for and download packages. These include owner, open-source licenses used by the package, link to version control where the package’s sources can be found, even user-defined attributes and more. Bintray is deployed on US, European, and Asian clusters and provides ultra-fast downloads over a rapid CDN (Akamai and Cloudfront). Rich stats provide detailed download information over any time period, and live logs provide detailed information about who is accessing your packages. Bintray’s tight integration with Artifactory means that you can fully automate your .NET development pipeline from development to distribution. Bintray can serve your enterprise distribution needs for all package types. In addition to NuGet, Bintray also offers native level support for Docker, Debian, Maven, RPM, and Vagrant packages. This means that Bintray maintains metadata specific to these package types and can work transparently with the corresponding clients. 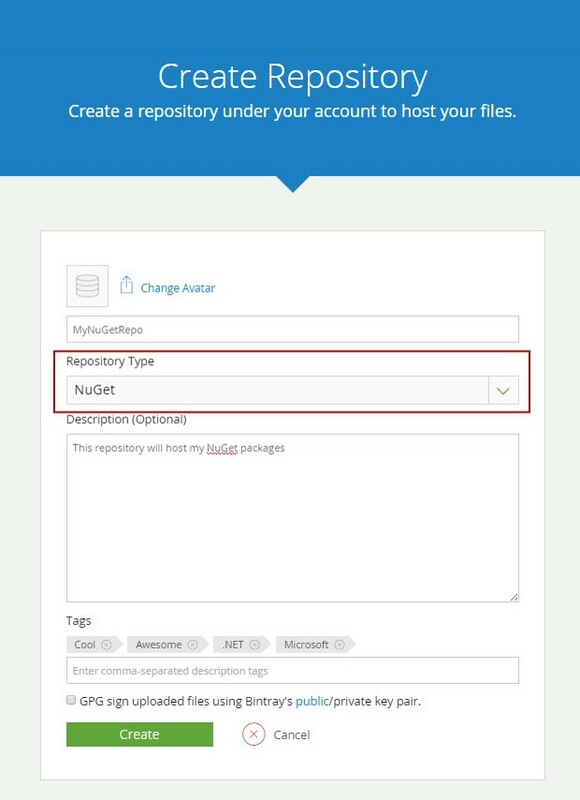 First, create a repository and specify its type to be NuGet. Now, all you need to do is point your NuGet client or Visual Studio at your new repository on Bintray. That’s just as easy, and Bintray even shows you how to do that. On your new repository page, just click Set Me Up. For the sake of readability, on this post, I’ll be using the NuGet client. As you can see, you’ll need to include your Bintray username and API Key. Now you should be able to see your package in your new NuGet repository, complete with the version you assigned. As you can see, once you have added Bintray as a source for your NuGet client, you can push and install transparently as if you were working with the NuGet Gallery. And since Bintray is a universal distribution hub, you can push to and pull from Bintray with the same ease when working with Docker, Debian, RPM, Maven, and Vagrant using the corresponding client for those package types. And with generic repositories on Bintray, you can host generic distributions such as installers or data files with the same ease of use. As we continue to add support for more and more package types, working with Bintray will just continue to get easier.